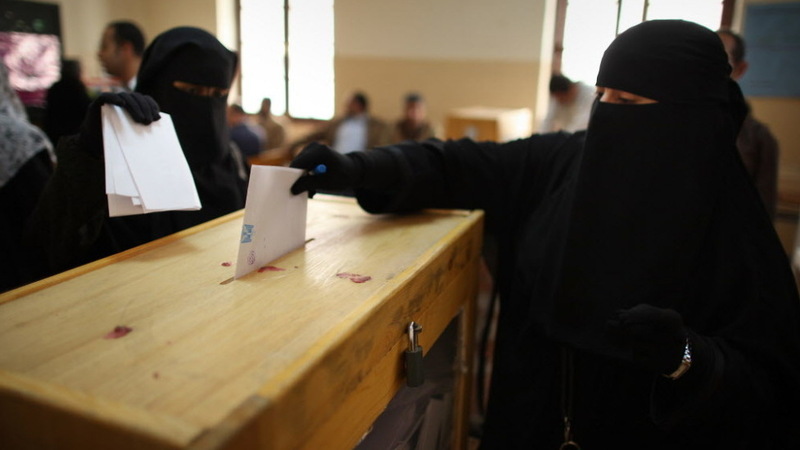 Nov. 28: Women place their votes in a ballot box at a polling station in a girls school in Cairo. Some results from the first round of voting in Egypt's parliamentary elections are being announced this hour. Already, according to al-Jazeera and other news outlets, there's word from the head of Egypt's Elections High commission that 62 percent of eligible voters cast ballots — about 8.5 million people. The Associated Press adds that Abdel-Mooaez Ibrahim called the number "the highest since the time of pharaohs." Al-Jazeera says that many of the individual races will be going to runoffs because no one candidate got a majority of votes. These are, of course, the first such elections since the toppling of President Hosni Mubarak's regime earlier this year in the early stages of the Arab Spring. We'll update with more as the results are announced. It's expected that Islamist religious parties collected the majority of votes and that the "long-banned Muslim Brotherhood" will play "a major role in the country's first freely elected parliament," The Associated Press reports. Jadaliyya.com has a "Concise Idiot's Guide to the Egyptian Elections" posted here. NPR's Lourdes Garcia-Navarro reports from Cairo that Abdel-Mooaez Ibrahim stopped delivering results abruptly after he got in an argument with a reporter. "It's yet another sign of the disarray brought on by Egypt's revolution and its steps toward democracy," Lourdes reported for All Things Considered. "This press conference had been repeatedly delayed. The electoral commission said it had trouble dealing with the high voter turnout." Lourdes said we do know one thing: The trends show that Islamist parties have done well. The Muslim Brotherhood, which is well-organized, has done particularly well and the more conservative Al Noor Salafi party has also had success. We'll add Lourdes' report to the top of this post a little later on tonight. "The head of the election commission, Abdel-Mooaez Ibrahim, did not announce full results for the first round of the election, which will take place in stages until March under a timeline set out by a council of military generals who took over from Mubarak in February. "Preliminary counts leaked by judges and individual political groups, however, have indicated that the Muslim Brotherhood's political arm took the largest share of votes. Following closely behind, is an ultraconservative Islamist party and a coalition of liberal parties called the Egyptian bloc, according to those unofficial counts."